Back to winning ways: James Horan tasted victory in his first game back in charge in Mayo. Photo: Sportsfile. The novel ending to last Sunday's clash with Leitrim grabbed plenty of national headlines this week, but on the field there is plenty that Mayo will have to work on over the coming weeks as they ramp up their preparations for the start of the National Football League against Roscommon. This weekend they move on to face Galway in Tuam Stadium in the semi-final of the FBD League at 1.30pm on Sunday and James Horan knows that his side will have to up their game against the Connacht champions. Speaking after last Sunday's game Horan said: "The first thing I will say is that Leitrim were very good today, they won the battle out there really and were unlucky not to win the game. We made a lot of mistakes and turnovers, particularly in the second half, so we were very lucky to get away with the draw and the guys did very well with the penalties. "But look, it is our first day out. Leitrim, under Terry Hyland - there is probably not a team in the country that has done as much work as them, he was appointed in early August, so we knew it would be a battle and they would be strong, but we will take a good bit out of it. 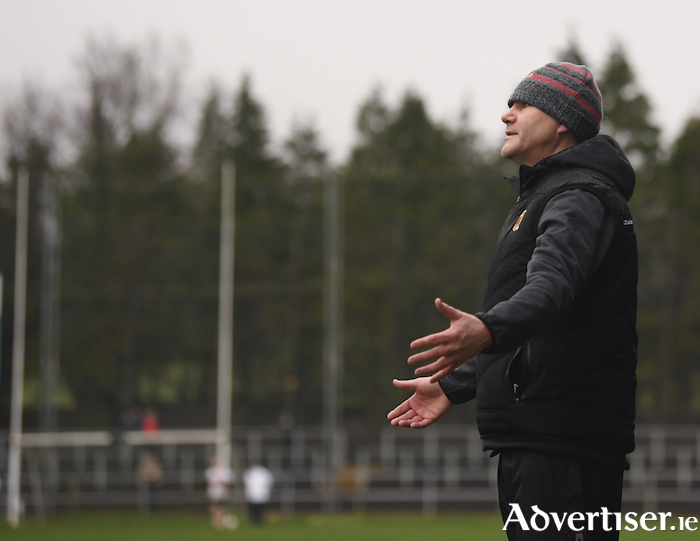 "In the first half Brian Reape, Evan Regan and Colm Moran did very well inside - Fergal Boland who was outstanding throughout, was very good, James Kelly came on and did very well - so there is a lot for us to take from it." Horan added that at the back there is plenty of scope for improvement: "Defensively we were very wide open, the ball went over our midfield - the ball went over us seven or eight times during the course of the game. I don't know how it is because we had a very experienced defence out, but overall a very mixed bag for us, Leitrim won the battle - but we stuck in there enough and the guys finished off the penalties very well and we'll take a lot from it, but plenty to do." The game offered Horan a chance to run his eye over a few players looking to make a break through this year and overall he was pleased with what he saw: "To see the new guys coming through, Brian Reape has a real eye for goal and did very well, he is very dangerous, he's a direct type of player when he gets the ball. Colm Moran is a very good ball winner and you'll see that as the season develops he'll get stronger, Evan Regan is working extremely hard, Oisin McLaughlin came on, Ciaran Tracey and James Kelly came on so we got a lot of new guys on the field and Fionn McDonnagh started." One player who caught his eye in particular was Fergal Boland, with the Mayo manager stating: "I was very happy with Fergal Boland and how he played and when the game was in the melting pot and he went looking for kick-outs and won two vital frees, that just probably settled us to get through, we should have won it in full time and got a bit complacent and a lot of our experienced boys again gave away a bad turnover, but overall I thought our new guys showed us something today." As for the new rules that were being trialed, Horan wasn't too keen, commenting: "It's very tough on refs what we are trying to do, refs are trying to read a game, keep an eye on something out of the corner of their eye, they have to count hand passes back here and not miss anything going on here - it is very tough for them, it is a tough game for them to ref as it is on top of it, I'm glad I'm not refereeing."